Soybean seeds contain three lipoxygenase (Lox) enzymes that are controlled by separate genes, Lox1, Lox2 and Lox3. Lipoxygenases play a role in the development of unpleasant flavors in foods containing soybean by oxidation of polyunsaturated fatty acids. Null alleles for all three enzymes have been identified, lox1, lox2 and lox3, and are known to be inherited as simple recessive alleles. Previous studies determined that a missense mutation rendered Lox2 inactive; however, the genetic cause of either lox1 or lox3 mutation was not known. The objectives of this study were the molecular characterization of both lox1 and lox3 mutant alleles and the development of molecular markers to accelerate breeding for Lox-free soybean varieties. 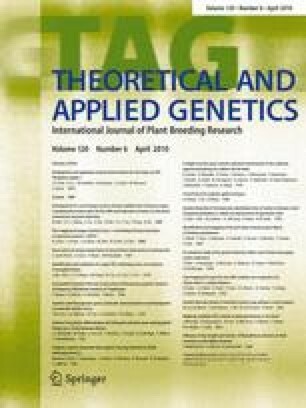 We identified two independent mutant alleles as the genetic causes of the lack of Lox1 in seeds of two lox1 mutant soybean lines. Similarly, a mutant allele that truncates Lox3 in a lox3 mutant soybean line was identified. Molecular markers were designed and confirmed to distinguish mutant, wild type, and heterozygous individuals for Lox1, Lox2 and Lox3 genes. Genotype and Lox phenotype analysis showed a perfect association between the inheritance of homozygous lox mutant alleles and the lack of Lox activity. Molecular characterization of a seed-lipoxygenase-free soybean line led to the discovery that an induced recombination event within the Lox1 gene was responsible for breaking the tight linkage in repulsion phase between mutant alleles at the Lox1 and Lox2 loci. The molecular resources developed in this work should accelerate the inclusion of the lipoxygenase-free trait in soybean varieties. The online version of this article (doi: 10.1007/s00122-009-1241-9) contains supplementary material, which is available to authorized users. This research was supported by the USDA-Agricultural research Service and the United Soybean Board.